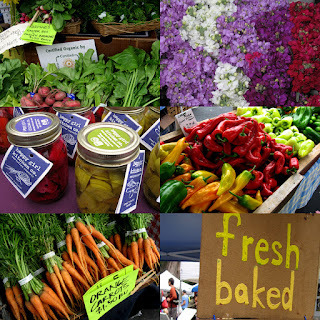 Morris Plains, NJ ~ The Talk of The Town: Keep Enjoying the Farmer's Market Here in Town! Keep Enjoying the Farmer's Market Here in Town! Come to the Morris Plains Farmers Market on Saturday from 9:00 - 2:00 for the best local fruits and veggies, jams, jellies, honey and apple cider from Ort Farms in Long Valley. Krakus Deli offers Polish pierogis, nut roll bread, cabbage stew, and kielbasi, fresh and grilled at the Market. Sutton Farms of Califon, New Jersey brings local cheese selections, New Jersey popcorn, and delicious peach salsa. Get every variety of pickles and olives from Pickles, Olives, etc. You won’t be able to resist the artisan breads from Hoboken Farms, frozen fish and beef, croissants, scones, sticky buns, and fresh mozzarella from Hoboken Farms. Hoboken Farms also sells Griggstown Quail and Poultry Farm chicken pot pies. Stop by Mara’s Country Desserts table for fruit and nut pies, key lime pies, cheesecakes, many varieties of quiches and the best chocolate chunk or oatmeal raisin cookies!